SS Nomadic, built as a tender to RMS Olympic and RMS Titanic, she is now the last surviving White Star Line vessel. At the dry dock where she was finished, Titanic spent her final days in Belfast. 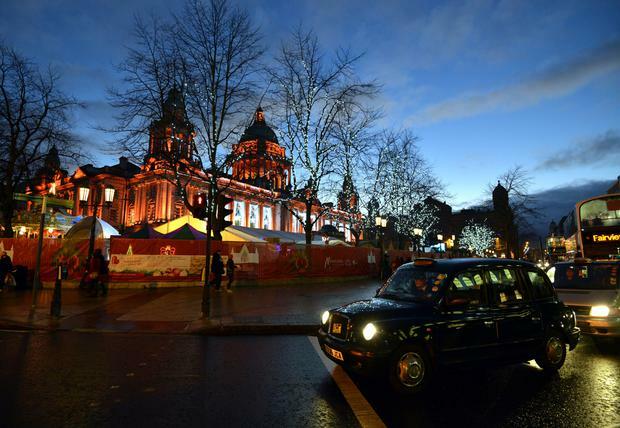 Belfast City Hall at Christmas, with black taxi in the foreground. Scheduled guided Titanic tours take in the historic Harland & Wolff shipyards and the famous Titanic sites around Belfast Harbour. Titanic Belfast has become an iconic draw - but it's far from the only Titanic attraction in the city. Here are 12 of the best. This is one of my favourite Titanic things to do in Belfast. 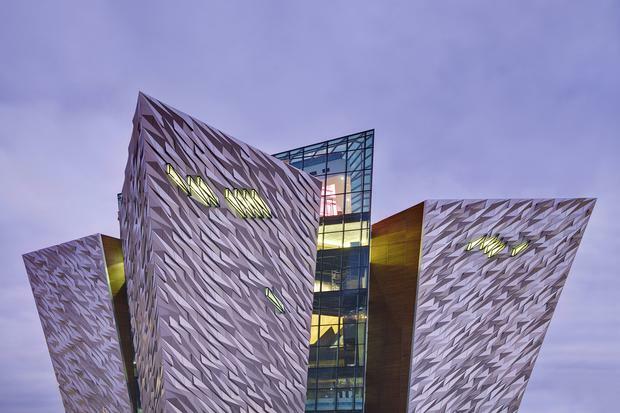 Whereas Titanic Belfast is all about scale and state-of-the-art exhibitions, TITANICa has the personal touch - boasting more than 500 original artefacts associated with the ship. A set of original plans is a highlight, for example – but you’ll also find a porthole and soup tureen recovered from the seabed. It’s a fascinating opportunity to learn about life on board through the personal stories of those connected with the ship. 2014 marked the museum's 50th birthday. This is your opportunity to walk in the footsteps of the men who designed and built Titanic in Belfast's historic shipyard. Less than half the price of entry to Titanic Belfast itself, the hour-long walking tour invites visitors to discover the ship from the spot where she was built and launched, including a walk through Harland & Wolff’s Drawing Offices - where Titanic and the rest of the mighty 'Olympic' class were designed. 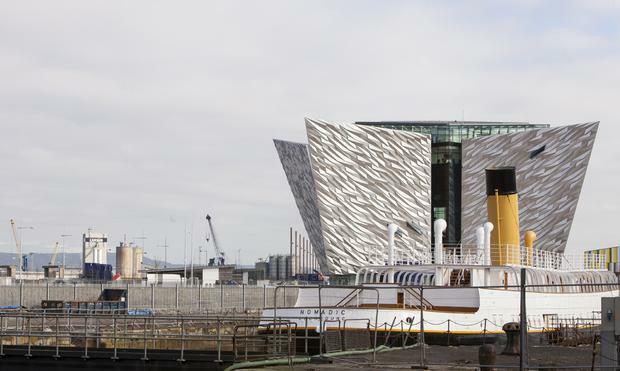 You’ll also learn about the creation of the iconic Titanic Belfast building - the world's largest Titanic visitor attraction, and now a symbol of a resurgent Northern Ireland. In 1911 Harland & Wolff built the SS Nomadic as the first and second-class passenger tender ship to the Titanic. Over 100 years later, the last remaining White Star Line ship has been restored to her original glory and is back home in Hamilton Dock. Step on board to experience a century of authentic maritime and social history. You’ve already seen where Titanic was built and witnessed the world’s largest Titanic attraction. Now, why not have a taste of the first-class menu? 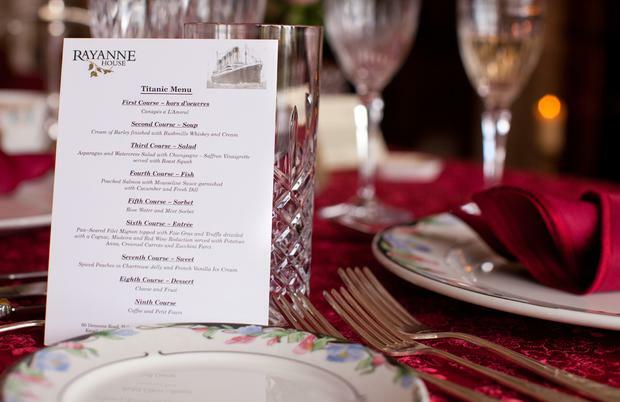 Rayanne House serves up a “Titanic Menu”, a recreation of the dinner served in the first-class restaurant. And yes, it's super-fancy - the entreé is a pan-seared filet mignon topped with foie gras and truffle drizzled with a Cognac, madeira and red wine reduction served with potatoes Anna, creamed carrots and zucchini farci. Wanna see the Titanic’s footprint? 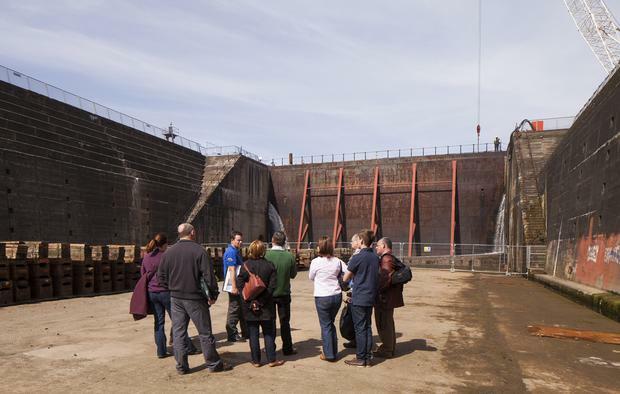 This seven-acre scheduled monument site includes the Thompson Dry Dock – in which the hull of Titanic sat as it was assembled - and its associated Pump-House. The Pump-House was the beating heart of Harland & Wolff's operation during the construction of the great White Star Liners - Britannic, Olympic and Titanic – and the dry dock gives an amazing sense of the scale of the ship. A visitor Centre & Café complements daily guided tours. City Hall's connections with the Titanic are many. In fact the Lord Mayor at the time of its opening, Sir Daniel Dixon, credited William Pirrie, the man who created Titanic, as having ‘the big ideas’ for City Hall. In its grounds, the Titanic Memorial, sculpted by Thomas Brock, pays tribute to 22 men who lost their lives on the ship. Another statue by Brock depicts Sir Edward Harland, ship’s plan in hand, who was Lord Mayor in 1885/6. Thanks to Pirrie’s influence, the Lord Mayor’s Suite is also known as ‘the Titanic Rooms’... craftsmen who worked on them went on to work on the famous liner. Titanic Walking Tours is owned and operated by Colin Cobb, a self-professed 'Titanorak' ever since doing a primary school project on the great liner. 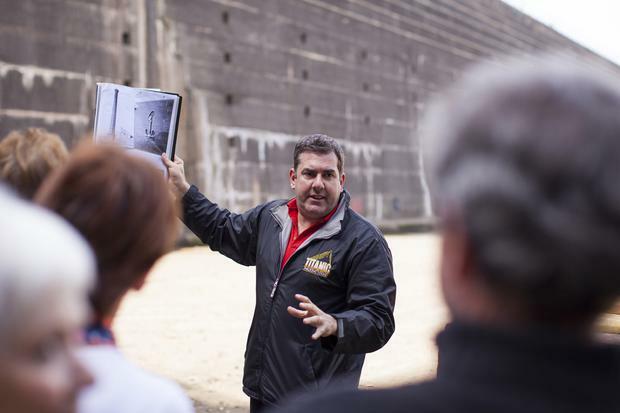 Join his two-hour tour of Queen’s Island, and you’ll follow in the footsteps of Titanic’s builders at the very sites where Titanic and her two sister ships were designed, built and launched. 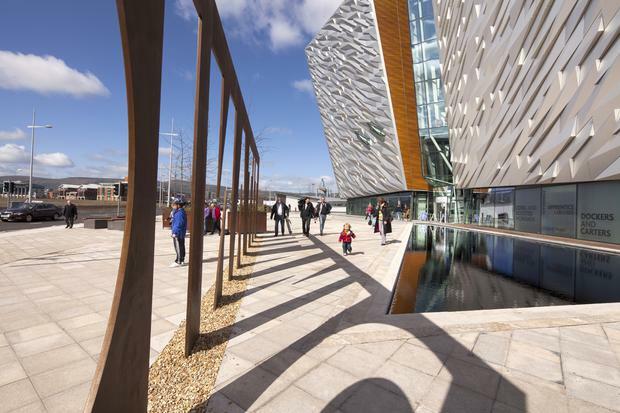 The tour departs from the main entrance of Titanic Belfast, and covers about a mile, with a café break of 30 minutes. 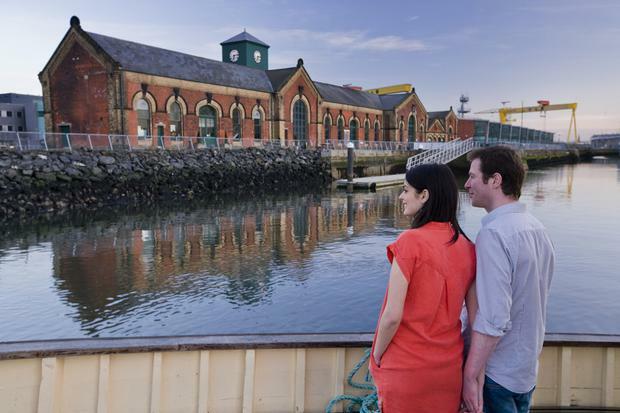 The Lagan Boat Company offers the world's only Titanic boat tour. Departing from Donegall Quay, scheduled tours take in the Harland & Wolff shipyards and the famous Titanic sites around Belfast Harbour, telling the story of Belfast's maritime heritage – not least how its port has developed from its industrial shipbuilding roots to the major tourist attraction of today. The boat tour also allows a view of the Titanic Quarter from the water… not a bad photo opp! Don’t fancy a walking tour? Why not hop on a Segway and glide from one Titanic location to the next? 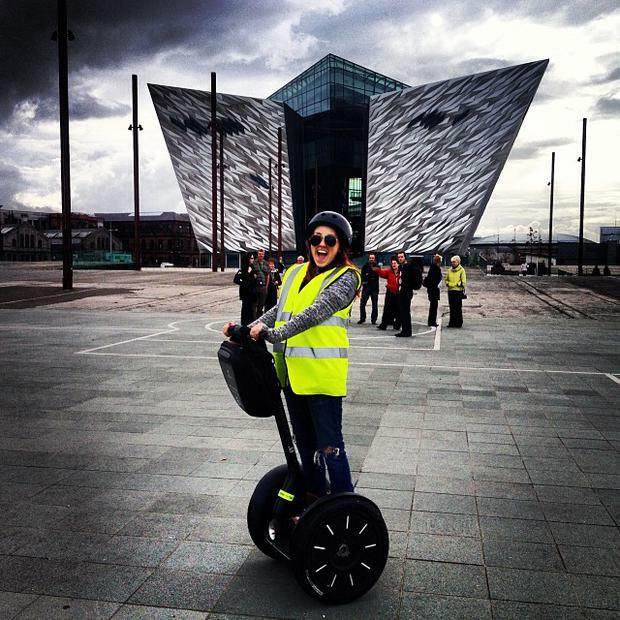 Starting from the Segway NI shop at Beflast’s ARC apartments, the tour takes in Titanic Belfast, the Harland & Wolff Drawing Rooms and the slipways where the White Star Line’s Olympic-class ships were created. From there, the Segways move on to Titanic Studios, where HBO's Game of Thrones is produced, and the Titanic Dock & Pump House. Don’t forget that all-important Segway selfie – nab it on the return journey with the huge Samson & Goliath yellow cranes in the background. 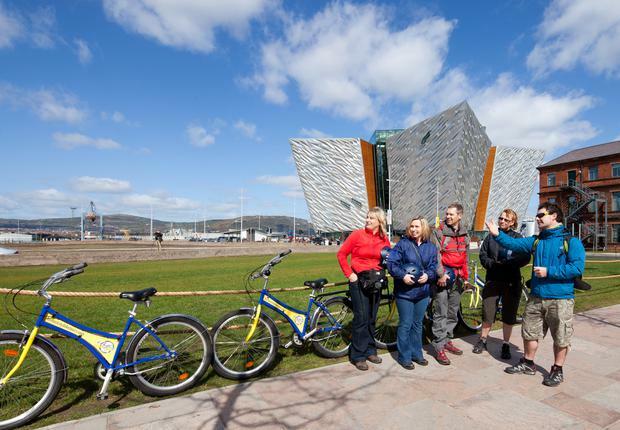 Belfast City Bike Tours offer fun, eco-friendly tours of the city with local guides - some visiting several sights accessible only by bike. There are three tours on offer – including a City Orientation Tour, Hilden Bike “N” Brew Tour and Titanic Bike “N” Boat. All are easy-paced, taking in over 20 points of interest with plenty of photo opps. Broadcaster and journalist Susie Millar is the great-granddaughter of Thomas Millar, who worked in Harland & Wolff on the construction of Titanic, and who then sailed on her fateful maiden voyage as an engineer. That makes her tour the only one in Belfast conducted by a direct descendant of a crew member. This story was compiled together with Discover Northern Ireland. For further info on Titanic attractions in Northern Ireland, check out www.discovernorthernireland.com/titanic. Exchange rates correct on day of publication.